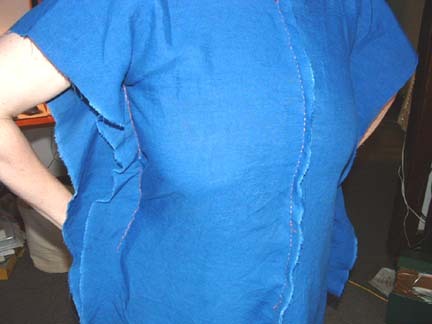 This photo-essay is intended to give you an overview of one way to drape fabric on a body to achieve a tight fit. Meet Sheree. My patient model who also happens to get two finished cottes out of this experiment. For this fitting, I decided to try something new. Rather than starting with 4 separate thin rectangular panels, (which is my typical method and one that is more historically supportable) I started with one solid piece of fabric with a hole cut out for her head. Please understand that this is a modern convenience, not to be construed as my interpretation of what historic tailors used. I used a blue linen fabric which will end up being the lining of her gown. Robin Netherton suggests trying this, and for both fittings I used the same lining material in order to do as ‘pure’ a comparison between them as possible. Since the center-front seam will remain comletely straight, I basted it shut first before beginning the fitting. I began by pinning the front and back panels together to form loose side seams. I routinely checked the center back piece to confirm that the fabric remains on-grain. When I’ve basted these side seams (not a tight fit yet), I will then fit the center-back seam. I worked on the side seams first in order to batten down the fabric a bit before centering the back seam. Before working on the back seam, this is what the fitting looks like so far. As you can see, bust support has not yet begun to take shape. 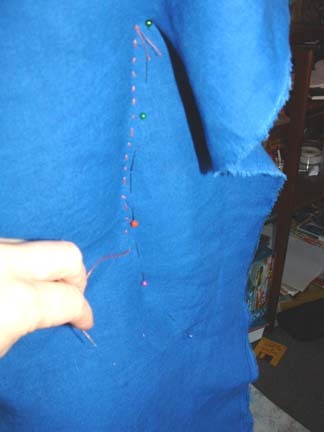 First, I pin the center-back seam, being careful to keep it straight and on-grain. 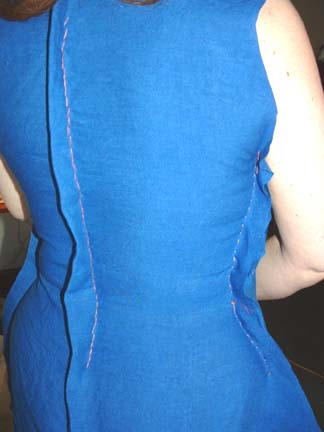 When the pinning is finished, I baste the center-back seam to about 3 inches below the curve of the lower back. At this point, the fabric is beginning to look form-fitting in the back. The bust fitting is best achieved, to start, from a supine position. This idea is promoted by Robin Netherton, and after trying it, I have to agree. At my request, Sheree repositions one breast as high as she can push it from the bottom up. This is so I can refit that side’s seam more snugly. I repin and fiddle with the side seams until it appears that the bottom of Sheree’s bust is pushed as high up as it will go. It is important that when adjusting seams, you keep your panels as on-grain as possible. Click here for a diagram. Before working with the armholes, her bust begins to look and feel supported, but there is some strange shaping which will be relieved once the armholes are shaped and fitted with sleeves. Another view of the fitting as it begins to come together. 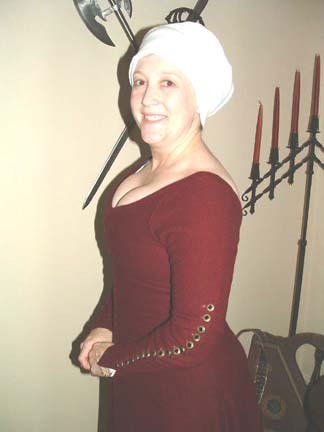 Sheree’s bust is reasonably supported even before the armholes and sleeves are worked in. 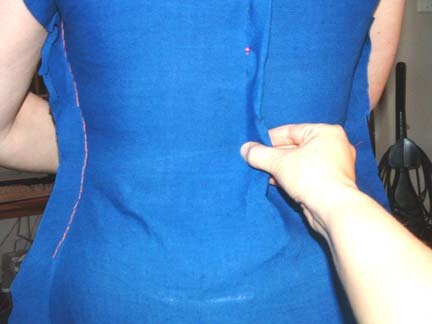 With S-curved sleeveheads pinned into the armhole, the bust appears much more naturally shaped. 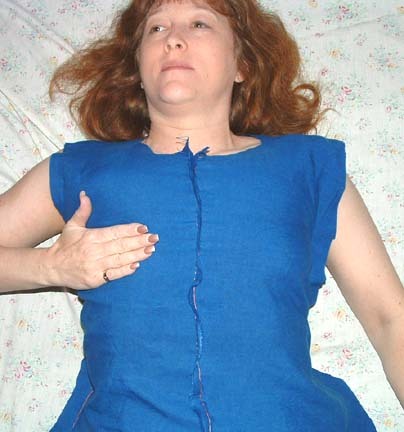 There is some compression on the lower-outside portion of her breasts, but this appears to be a common side-effect of this fitting style on well-endowed women. A bird’s-eye view showing the shaping of the bust from above. 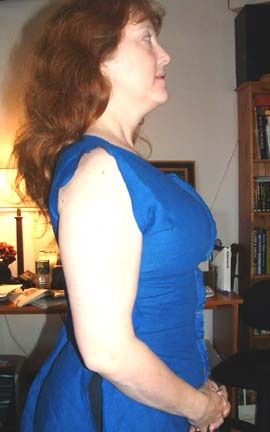 Before cutting out the neckline, I did a quick running stitch at the point at which the final neckline will be placed. This helps add some integrity to the fabric before cutting into it, mostly on the bias. The shape of a front panel piece in its finished state. Every body will produce a unique set of panels. This should serve as a general guide, but if you don’t get this shape, there is no problem, as long as your final panels support your bust asthetically and practically. 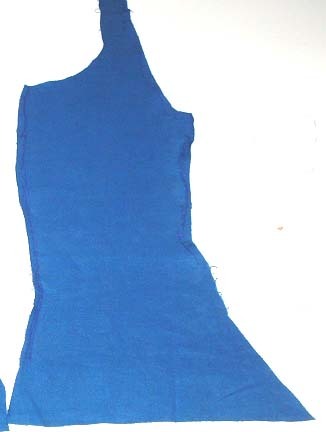 The shape of a back panel piece in its finished state. 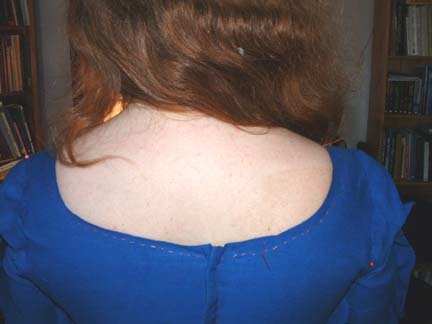 Note that the back of the armhole is less curved than the front. 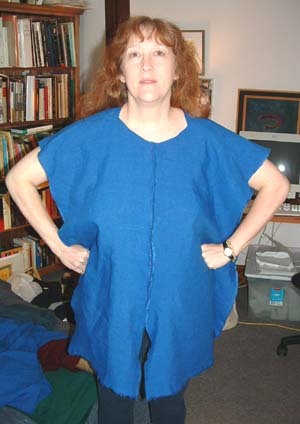 You may need to experiment with the shape of the armhole to fit the body properly. 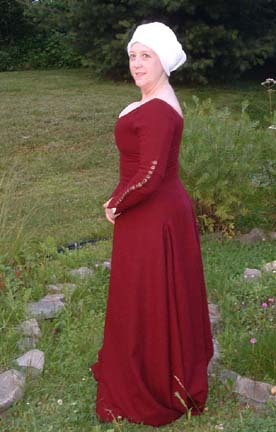 Sheree’s finished gown is a maroon wool twill that spiral-laces in the front and is closed along the arms with buttons. The neckline of this gown was considerably lower than the neckline of the curved-front-seam gown I produced for this experiment. I did not make the two gowns’ necklines at different levels on purpose. In retrospect, I think this gown could have benefited from wider shoulder seams and a higher back. Another view of the final gown produced from my fitting using a straight-front-seamed method with four panels. This fitting method produces a much more pronounced “shelf” of cleavage than the curved-front-seam method. Please take a look at the Comparison section to read details of how these two shaping methods stacked up against each other. I have been making myself crazy trying to achieve a dress without a princess line since June. NOW I have an idea where to start. THANK YOU so much. You can see the result in my FB page, but now know how I should have done it. thanks so much, once again. Thank you! I’ve been making this style of dress for many years now, and this tutorial is still the best one I’ve found. 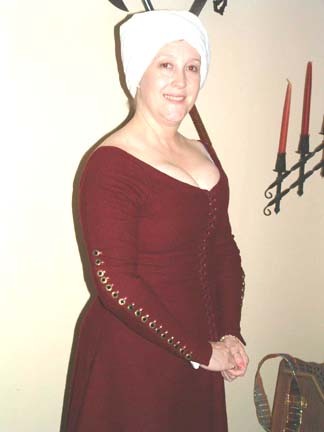 Converting my area from viking to medieval, one set of cleavage at a time… A handy tip if one is trying to fit oneself: Baste a long zipper into the center front seam, so you can get in & out of it between adjustments. It makes fine-tuning the fit easier! The zipper is certainly a good idea! I also use two strips of “lacing holes”, which I sewed up quickly using my machine’s buttonhole function. I just baste these to the center front and do the same thing a zipper does, but the hard way. Hee… Part of the problem is that those tutorials are 10 years old, and I’ve refined my methods a ton since creating them. I tell myself I’ll go back and do new versions, but then something else shiny comes along and it gets pushed down the list again. Very, very usefull. Thank you very much! My question is do you pull the dress on over your head? I am just starting sewing and this was the first tutorial that makes sense, haha. I’m just concerned the difference in size between bust and waist would make it impossible to pull it on. 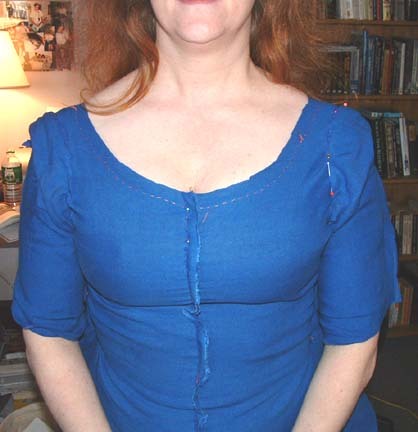 The pattern I have has a facing and I believe they want the cotehardie to be laced from neckline to about hip. If I could avoid that, I’d like to as I’m not sure how well that would turn out with my newness to sewing. 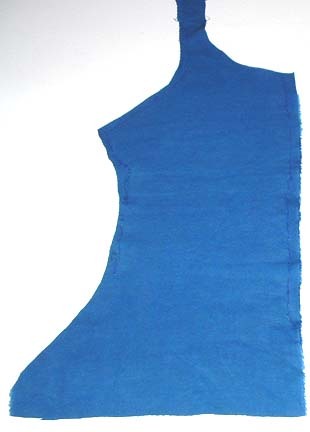 Also, the blue became the lining of the dress, but would this still work for a dress with no lining? Hi Rachel, no, you wouldn’t want to make this dress for pulling on over the head. The lacing is there to allow you to get it snug enough under the ribcage so that short of being double-jointed, your shoulders would not fit through the torso opening. YOu’re effectively making making a tight dress with room built into it like a bra for your breasts. The patterns I use require lacing for that. Without it or some other sort of support, most women’s breasts will creep downward over time for a displeasing feel and look. Since you are new to sewing, it will be up to you if you want to dive into the challenge, but I think you can do it — sewing your own eyelets (or even just making them from the buttonhole attachment on a sewing machine) isn’t terribly hard to learn — they just take time. And yes, this will work for an unlined dress too. 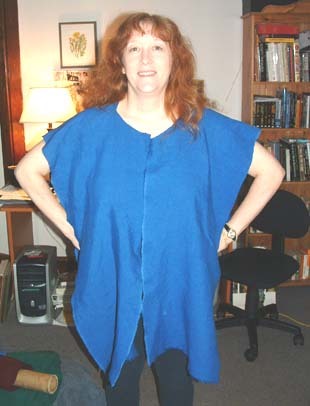 I used to make these out of one layer of linen and wore them in the heat of the summer with zero problem, and my measurements were in the DD cup range. Best of luck and happy sewing! Thanks for getting back to me so quickly! And I’m glad to hear it worked for DD as that’s what I am, haha. I was concerned about it being able to keep the girls in place. I think I’m going to give it a go. If it doesn’t work, I’ll learn from my mistakes and try again. Thanks again for your help and such an easy to follow tutorial! One more important note — the dresses that worked in one layer for me were done in linen, not wool. Silk would work too, as long as it’s not raw or noile silk. (Those fabrics are made from short fibers which greatly reduce their tensile strength.) I also cut linen dresses so that the warp goes horizontally across the body, not vertically. This makes the fabric tougher and less prone to any stretch-out. Wool will stretch in one layer, which is why the lining is done in linen — to rein the girls in and keep them there. So, to sum up, I think the best way to start is with linen, and if you’re not too tall, you can cut your pattern pieces horizontally from selvedge to selvedge for maximum conservation and a stronger bust support. Good luck! Have you seen it work on anyone with a waist/bust difference of 12″ (J cup)? Yes! It can work for just about all sizes, including the large ones. I will state though that I think the curved-front method is easier to fit on large busts. Question – this was forwarded to me by a SCAdian friend who knows my battle with garb… do you know anyone who has used this fitting method for higher than a DD? I’m *significantly* bustier than that and have had a bear of a time with pattern making around that curve. I’ve had corsetiers tell me not to wear mundane underpinnings beneath my garb, but alas, I cannot afford their services to provide me with fitted garments. Yes, I occasionally am larger than a DD, and I know others who are well above that size and who have success. It takes some wrangling and you won’t know what the final look is until the sleeves are sewn in, but yes, it certainly can work! Thank you for this tutorial! I am making a black linen cotehardie and am doing a lot of silver embroidery on it, it’s my first one but I’ve been sewing for years and have essentially gone professional. Although i did not use this technique on the one I’m currently working on I will definitely try it on my next one. Ive found that just keeping the tension very tight with buttons and tight sleeves is working well. Thank you again!! !